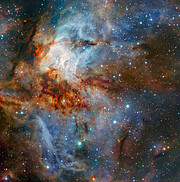 This image shows the star cluster RCW 38, as captured by the HAWK-I infrared imager mounted on ESO’s Very Large Telescope (VLT) in Chile. By gazing into infrared wavelengths, HAWK-I can examine dust-shrouded star clusters like RCW 38, providing an unparalleled view of the stars forming within. 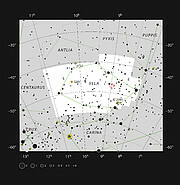 This cluster contains hundreds of young, hot, massive stars, and lies some 5500 light-years away in the constellation of Vela (The Sails). 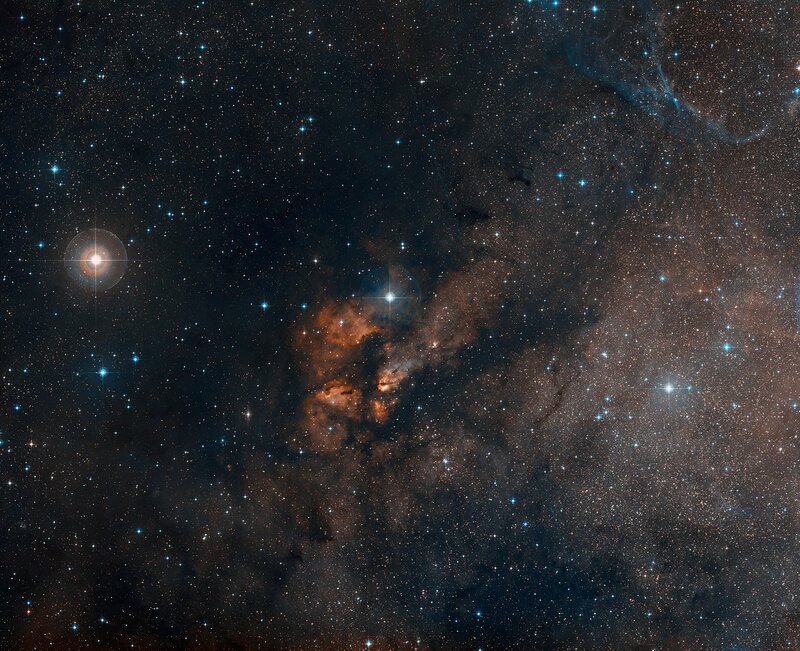 The central area of RCW 38 is visible here as a bright, blue-tinted region, an area inhabited by numerous very young stars and protostars that are still in the process of forming. The intense radiation pouring out from these newly born stars causes the surrounding gas to glow brightly. This is in stark contrast to the streams of cooler cosmic dust winding through the region, which glow gently in dark shades of red and orange. The contrast creates this spectacular scene — a piece of celestial artwork. Previous images of this region taken in optical wavelengths are strikingly different — optical images appear emptier of stars due to dust and gas blocking our view of the cluster. 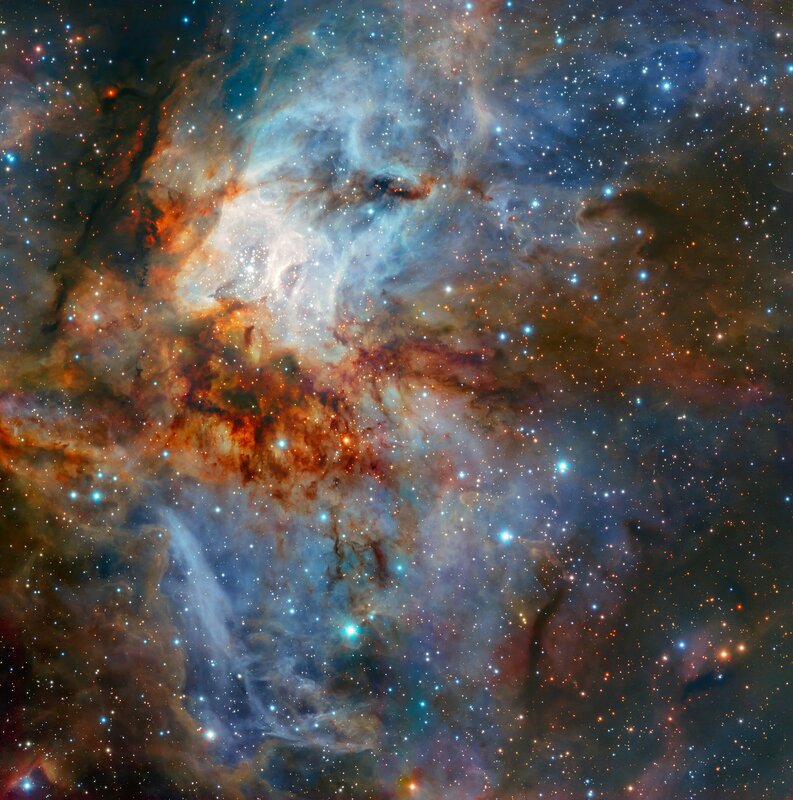 Observations in the infrared, however, allow us to peer through the dust that obscures the view in the optical and delve into the heart of this star cluster. HAWK-I is installed on Unit Telescope 4 (Yepun) of the VLT, and operates at near-infrared wavelengths. 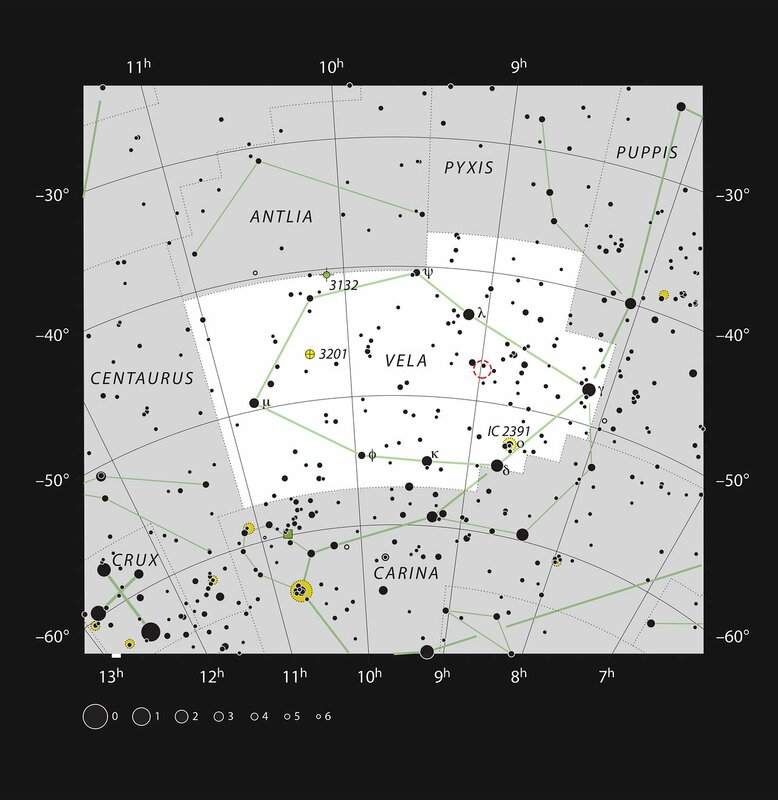 It has many scientific roles, including obtaining images of nearby galaxies or large nebulae as well as individual stars and exoplanets. GRAAL is an adaptive optics module which helps HAWK-I to produce these spectacular images. It makes use of four laser beams projected into the night sky, which act as artificial reference stars, used to correct for the effects of atmospheric turbulence — providing a sharper image. This image was captured as part of a series of test observations — a process known as science verification — for HAWK-I and GRAAL. These tests are an integral part of the commissioning of a new instrument on the VLT, and include a set of typical scientific observations that verify and demonstrate the capabilities of the new instrument. The Principal Investigator of the observing proposal which led this spectacular image was Koraljka Muzic (CENTRA, University of Lisbon, Portugal). Her collaborators were Joana Ascenso (CENTRA, University of Porto, Portugal), Amelia Bayo (University of Valparaiso, Chile), Arjan Bik (Stockholm University, Sweden), Hervé Bouy (Laboratoire d’astrophysique de Bordeaux, France), Lucas Cieza (University Diego Portales, Chile), Vincent Geers (UKATC, UK), Ray Jayawardhana (York University, Canada), Karla Peña Ramírez (University of Antofagasta, Chile), Rainer Schoedel (Instituto de Astrofísica de Andalucía, Spain), and Aleks Scholz (University of St Andrews, UK). The Science Verification of HAWK-I with the GRAAL adaptive optics module was presented in an article in ESO’s quarterly journal The Messenger entitled HAWK-I GRAAL Science Verification. The science verification team was composed of Bruno Leibundgut, Pascale Hibon, Harald Kuntschner, Cyrielle Opitom, Jerome Paufique, Monika Petr-Gotzens, Ralf Siebenmorgen, Elena Valenti and Anita Zanella, all from ESO. The Messenger 172 containing the paper HAWK-I GRAAL Science Verification.